Updated 8/19/11: Winner announced below the contest rules! Sometimes you just know something is going to be good. Sometimes you have to pat yourself on the back. Today’s lunch was one of those moments. While digging madly through the cupboards to find fast lunch ideas for my already starved* children, I realized I was out of bread, cheese, tortillas, apples, and all sorts of other things I rely on to fill their hollow legs quickly. *Or so they said repeatedly and loudly while clinging to my legs. Thankfully, a perusal of the refrigerator revealed a big bucket of my special no-knead semolina pizza dough and some leftover cooked spinach. Serendipitously, they were resting right next to a fresh jar of bacon jam and a dozen fresh eggs from our chickens. I knew I had the ingredients to make a great lunch but what I didn’t know was just how epic and satisfying that lunch would turn out to be. I found that I was on auto-pilot setting when I noticed I automatically pre-heated my oven to four hundred and seventy five degrees without thinking after setting the bucket of dough on the counter*. *That is the temperature at which I cook all of my pizzas, but this is the subject of an upcoming post. Oooh, spoilers! A tease and a Doctor Who reference all in one sidebar. I’m not proud. …showered the top generously with more asiago and shook an indecent amount of hot sauce over the whole thing. I cut it in half, paused for a quick picture, admired the runny yolk, and there was a knock at the door. Half an hour later, I was able to dig in. I can honestly tell you this tastes incredible at room temperature… I’m equally certain that it would taste most amazing hot, but at least I can tell you it’s better than just okay when cool. *I guess maybe that one time I tried to use it as perfume didn’t work out really well… But everything else? Golden. 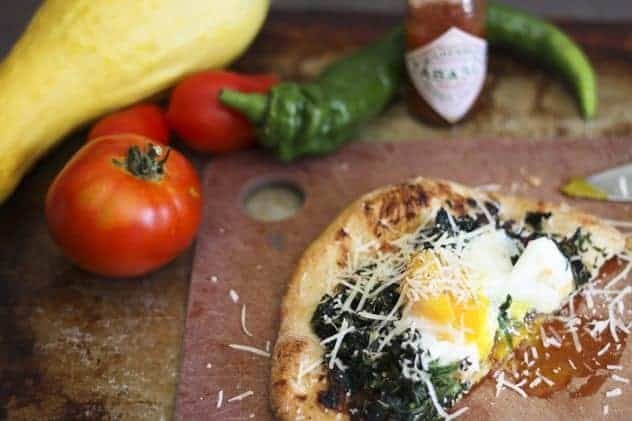 The salty, smoky, meaty, sweet, perfect umami bacony goodness that is bacon jam on pizza crust topped with spinach (hello, lover), an egg that I just took out of the coop this morning and a shower of finely grated asiago cheese? You could say this auto-pilot lunch was inspired. So, I thanked the source of all inspiration and blessings and ate my really excellent cold lunch pizza. Pssst. I’m sharing my pizza dough recipe with you here today so you can get it in your refrigerator and use it both for this recipe and upcoming ones. This is a big hint. BIG HINT. Now. Another giveaway! And hoo-doggy it’s a hot one. The generous folks at Smuckers offered to send one of Foodie with Family’s readers a pretty amazing gift basket. And when I say pretty amazing I mean four seriously pretty pink and green striped ice cream REAL (as in not plastic) bowls, an ice cream scoop, some of their new ice cream toppings (Blueberry and Hot Caramel) some of their classic toppings (Hot Fudge), some sweetened condensed milk (Used to make their dead easy 3-ingredient ice cream for which they include the recipe!) and -wait for it- a $75 gift certificate to Cooking.com. So what does this have to do with a fancy-pants breakfast pizza? What goes better with pizza than a milkshake, I ask you? Not a thing, as far as I’m concerned. And if I accidentally dolloped some of that caramel sauce into the blender with my ice cream and milk then I might have accidentally really loved it, too. I highly recommend accidentally doing that. Happy, happy day. What do you need to do to enter this contest? This is one of my patented super complex entries. Leave a comment. Tell me what you like to eat with your milkshakes, what you would do with the $75 gift certificate, what your favourite ice cream topper is (Smuckers or otherwise), about the time you poured Magic Shell over your brother’s head, or what you like on your breakfast pizza. That’s it! Not too shabby for a chance to win all those goodies, eh? The winner will be chosen by random.org and announced here on Friday, August 19th. TiffH Well here in Oklahoma I love me a Strawberry milkshake with crinkle cut fries from Braum’s Ice Cream. And as far as cooking gift card I would get the ice cream maker I’ve been wanting (cuz I don’t have one) and use it with all that spiffy Smucker’s ice cream toppings and bowls… yeah! Can you overnight me some of that pizza because it looks delicious, and the egg on top genius! TiffH, email me your mailing address and whatnot and I’ll send that right onto the folks at Smuckers! Oh, and do me a favour? Since they’re being so generous, show them a little love and head on over to their website. They have some pretty fine dessert recipes posted! This is, without a doubt, the best pizza dough I've ever made and eaten. The fact that it is no-knead and incredibly simple to make adds to its already ample charms. It bakes up as a beautifully crisp bottomed, chewy pizza crust but can also be made into pita bread and focaccia. It's like the bass-o-matic of pizza doughs! Inspired by Artisan Bread in Five Minutes a Day by Zoë François and Jeff Hertzberg. Stir in the flour until no dry pockets remain. You do not have to knead it, but I find the easiest way to have it thoroughly mixed is to wet one hand and forearm and use that one to mix it in completely. Cover lightly (Do not put a lid on tight. Trust me.) and let rest at room temperature until the dough has doubled and collapsed. (Or at least until dough is very, very puffy.) This takes a less than 2 hours in warm weather and more than 2 hours in cool or cold temperatures. You can use the dough immediately. If you have leftovers, you can store them in the container, lightly covered (again, do not use a tight lid!) for up to 10 days. If you need to store the dough beyond that time, divide into individual pizza sized servings. Freeze in re-sealable plastic bags that have about a teaspoon of olive oil smeared around inside each for up to 3 months. On a clean, floured surface, roll or press out pizza dough until it is about 1/4-inch thick in the center and slightly thicker around the edges. Sprinkle 1 tablespoon of the asiago over the bacon jam and scatter the spinach over the top. Sprinkle semolina or cornmeal over a pizza peel (if using a pizza stone) or a baking sheet (if no stone is available.) Transfer the dough, carefully, to the dusted peel or pan. If using the stone, slide the pizza directly onto the stone, if using the sheet, slide the sheet directly into the center of the oven. Bake for 4 minutes then open the door of the oven and pour the cracked egg directly into the center of the pizza. This is easiest if the bowl or measuring cup is held right next to the pizza to minimize the egg running. Bake an additional 8-14 minutes or until the egg is done to your liking. I pulled mine when the whites were firmly set and the yolk was still mostly runny. Transfer the pizza to a cutting board, sprinkle with the remaining asiago cheese. Serve hot or cold with hot sauce, if desired. Butterscotch malt with a hot dog slathered in ketchup! (Yeah, I’m weird). Let’s see… french fries dipped in a chocolate milkshake are heavenly, in my book… $75 at cooking.com? The possibilities are endless & my wishlist rather long. Ah, Magic Shell. I remember that! I love me some fresh berries over my vanilla ice cream, thank you very much. Thanks! I would use the $75 gift card to buy a new slow cooker (mine broke!) so I can make more bacon jam. All my friends ate my reserves. Then I will invite them over for a pizza and milkshake party! I love Smuckers, especially their Orchard’s Finest line. What do I like with my milkshakes? More milkshakes! I love mint oreo flavor, especially. As far as a gift certificate, I’ve been coveting cute casserole dishes lately. Especially in orange or with polka dots. And that pizza looks amazing. I love runny egg. With my milkshake? A big, juicy burger. With $75? All the things that I’d like to buy but can’t justify in my relentless head. And on the breakfast pizza? You can’t beat eggs and bacon jam. I’d just add red pepper flakes or my beloved Sriracha hot sauce. You’re supposed to EAT something with a milkshake? Can it be more milkshake? hmmm i would definitively use the 75$ to get more supplies for the dorm to cook, nothing like being in the dorms in the winter time with my rice cooker for some hot pot, or something steamed. I think the best thing with a milkshake is a juicy burger and crispy waffle fries. With a $75 gift certificate from cooking.com I would probably buy a really nice chef’s knife. My favorite ice cream topping would be salty peanuts with either hot fudge or caramel sauce. I also really like creme de menthe on my ice cream. I haven’t ever had much in the way of good breakfast pizza, but what you described today looks fabulous. Thanks for the recipe, looks great =). Milkshake. . . you eat things with them? At my house we normally have berry milkshakes and we add shhhht (whipped topping) and chocolate chips. Sometimes it is just for dessert but usually it is our whole meal! I hope you didn’t have to wait a half-hour to eat lunch because I was being so demanding today. I like hot fudge-marshmallow milkshakes. They are too sweet for some people, but not for me! I invented them the summer I worked at the ice cream place by my house and still request them every time I’m there. Hot fudge and marshmallow also works as a sundae topping. Some Heath Bar bits are nice to add crunch. For me it’s always about the burger and milkshake. Preferably banana. This pizza looks amazing! I’m kind of with Kate, love some salty French fries with a sweet milkshake. I just had a Nutella milkshake with burnt marshmallows! It was fantastic! It was consumed wirh the best turkey burger ever! With a coffee or mocha milkshake, I’d like a nice juicy Angus burger with french fries – what topping do I like on my ice cream – another scoop please. Oops -forgot the $75 gift to Cooking.com – would opt for a 3.5 sturdy light weight dutch oven or a new bundt cake pan or a number of the myriad items they have for sale. French fries are the only thing that should be eaten with milkshakes! Your house sounds just like my house with 5 boys who are always “starving”! Oh and my favorite topping is homemade hot fudge…nothing beats it. Salty fries with a shake, caramel and hot fudge on ice-cream. Yum! Thanks for the pizza dough recipe- will definitely be trying it out! $75? To Cooking.com?!?! I would buy a dutch oven…a big one…I’ve been yearning for one for years! I think milkshakes pair wonderfully with deep fried onions, any form, onion rings, onion blossom, you name it. As long as there’s greasy fried batter around it! As for my ice cream toppings, I don’t usually need more sweet stuff, to distract the flavor of the ice cream itself, so some chopped up nuts will usually do! A grilled cheese sandwich goes perfectly with a milkshake. Not a gourmet sandwich either, just one cheese on plain white bread. My favorite ice cream topper is mini peanut butter chips followed by caramel topping. I would shop for my husband’s corporate apartment with a $75 gift certificate. I am there often as it is not too far of a drive but I dread cooking in the kitchen. I cannot bring all my favorite things with me each time so I would buy either a dutch oven or a better knife for this kitchen. And when the project is done I would get another great thing for our kitchen! 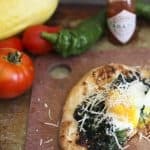 I have never had breakfast pizza but this recipe has inspired me to try it this weekend, THANKS! favorite ice-cream topping: fresh strawberries, it doesn’t get better then that! With my milkshake….burger, or fries, or both….or just the milkshake! I would NEVER waste Magic Shell by pouring it over my brother’s head (although since he shaves it bald now, I am sure we could get most of it off…)! And I would LOVE to buy anything on cooking.com! Maybe an ice cream maker attachment for my Kitchenaid?!?!? I like french fries with my milkshake, and hot fudge on my ice cream. I haven’t had a milkshake in so long. I would probably pair it with one of my favorite ice cream toppings, like oreos or graham crackers. And as for the gift certificate – a new blender! I would use the contents of the gift basket to host a back-to-school ice cream party for my son (school starts three weeks from today – yay!). My favorite way to enjoy a milkshake is on its own, so I can fully enjoy the flavors. My favorite topping? Good ol’ hot fudge! I love the classic burger and fries with a milkshake. If I win, I would like to use the $75 to purchase an electric ice cream maker and the gift basket I will share with my grandkids. My favorite ice cream topper is chocolate fudge hard shell and marshmallow cream. Thanks for this awesome giveaway! I love caramel on anything, especially milkshakes and ice cream! The gift certificate would help me replace my favorite pan. Thanks for the recipes! I just had lunch and yet the prospect of pizza and ice cream(milkshakes) makes me think I could eat again. Yum. With the $75 gift certificate I would get some much needed kitchen stuff since I am renovating my apartment. When I was a kid I loved the magic shell because..well, frankly it is awesome. These days I have become a caramel-addict so I’d really just like to have a little ice cream so I’m not scooping caramel out of the jar! 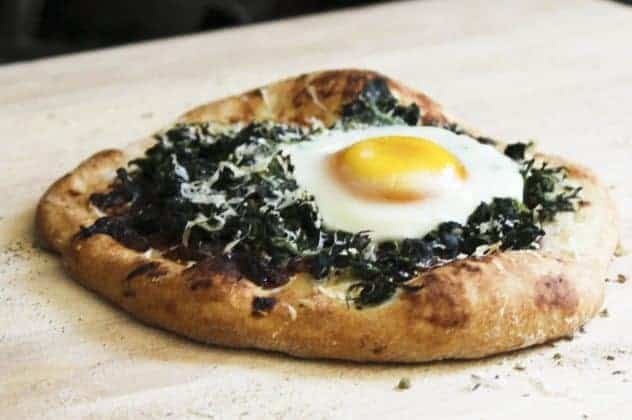 Lastly, I have never had a breakfast pizza which I do believe is a crime since I have had every other pizza imaginable (curry, dessert, regular dinner, flat, stuffed crust, you name it-except breakfast, so I guess I’m going to have to make some bacon jam and dig in! Yum! I love french fries with milkshakes! I haven’t had a milkshake in years! I would probably just have it by itself and enjoy every last sip! Favorite ice cream toppings: anything caramel or butterscotch, or the blueberry peach sauce my mother in law makes. That stuff is amazing! LOVE Smuckers Sour Cherry preserves…fell hard for them this summer with warm corn muffins, mmmmm. That pizza looks fab and since I have dough sitting o the counter rising now, it may be my dinner tonight! Smuckers’ basic strawberry jam is pure delight. As for the milkshake, I like to precede it with a healthy green salad, so I can wallow in the milkshake while feeling virtuous. Mmmmm, Smuckers. In love with the new Orchard’s Finest line and their ice cream toppings are the best. Would love to try their new line. French fries in milkshakes is the bombdiggity. If you haven’t done it, go and do it right now. I made a similar breakfast pizza but used broccolini and crumbled bacon — it was divine! Milkshakes + greasy burger = HEAVEN! In other news – I stumbled upon your blog yesterday and now I’m addicted! I’m a milkshake and greasy cheeseburger girl. Can’t seem to separate the two. YUM! Love the giveaway, by the way. Love Smuckers and ice cream. I’d use the gift certificate to stock up on new baking pans. Can’t have too many. Coffee ice cream with hot fudge topping, but the chocolate milkshake stands on its own! I’m definitely bookmarking this dough recipe! I need a good pizza dough recipe. Every attempt thus far has been…sad. As for what I’d eat with a milkshake…probably a cheeseburger! I need something salty to counteract the sweetness. Pizza would probably be a close second choice. I’ll take a sprinkle of cinnamon and nutmeg on my pumpkin shake-my absolute favorite available only in the fall. That $75.00 would be used to find a good shake maker because I never get the consistency right when I use a blender. I like reliable old Hershey syrup on my ice cream but I want to find that blueberry flavor now so I can make that my new favorite. I remember Magic Shell! Haven’t had it since I was a kid. Sighhh… Trade the spinach for asparagus and onion add the egg and you have the perfect breakfast pizza. Probably anything chocolate…maybe not bugs. I love to dip my french fries in my milkshakes! My bf thinks it’s disgusting but I love that salty, sweet, hot, cold combo. Also, I’d use that Ice Cream recipe to FINALLY make home made ice cream in my ice cream maker that has never been out of the box. Since I got it for Christmas. 3 years ago. YUM! I love french fries with a dark chocolate milkshake. With a gift certificate I would think really hard about a good blender. I don’t have one and would love to remedy that. I love rich real vanilla bean ice cream and sometimes pour black coffee over it. It’s so delicious! Milkshakes should always be accompanied by a cheeseburger and french fries, whenever possible. Your mind travels in circles I’d like to know!!! WOW, that pizza sounds AWESOME. Hmmm. I think my favorite MEMORY of drinking shakes – ok, really a malt – is at Hudson’s in El Paso. We drank chocolate malts with REAL nachos. Ohhhh, they were SOOO good. And what I want most if the cooking.com GC. WOW, what a generous prize package!!!!! (I love shopping at cooking.com!! :D) Thanks for the opportunity to win!! I prefer piping hot skin-on fries with my hot fudge coffee malt, I really need a new knife and $75 sounds just right, I adore hot fudge and toasted pecans on my ice cream, and my preferred breakfast pizza is good old eggs and cheddar and bacon and fresh tomatoes…mmmmm…. I love soyrizo on my breakfast pizza! yum! Smuckers jelly on them. mmmm! I love a milkshake with a hamburger and fries. Yum! I love a strawberry milkshake with a good juicy cheeseburger. I would use a 75 dollar gift certificate for a cast iron pot. I like smuckers caramel sauce on my ice cream . And this pizza is awesome. Nothing tastes better with a strawberry milkshake than a rich, chewy, chocolatey brownie! I’d spend the $75 gift certificate at cooking.com on an ice cream maker that I’ve been lusting over. My favorite ice cream topping? – It’s a warm raspberry sauce that I make just for topping ice cream in the wintertime! Another use for awesome bacon jam, yeah!!!! I would probably use the gift certificate for a baking stone and a silpat, two items I have been seeking for quite some time now but haven’t been able to find the dough! :-) Thanks for the recipe and the giveaway! I Love eggs on pizza and I love ice cream more than any other (dessert) in the world! Yum! I must make some of this bacon jam… stat. This lunch…sigh. I want to move in with you. Spoilers! Have you watched yet?? HUH? HUH? Honestly, I am looking forward to the pizza post to see you explain the 475. As opposed to, say, 500 or 550. Bacon in any form must be on a breakfast pizza. And Caramel is my best friend. 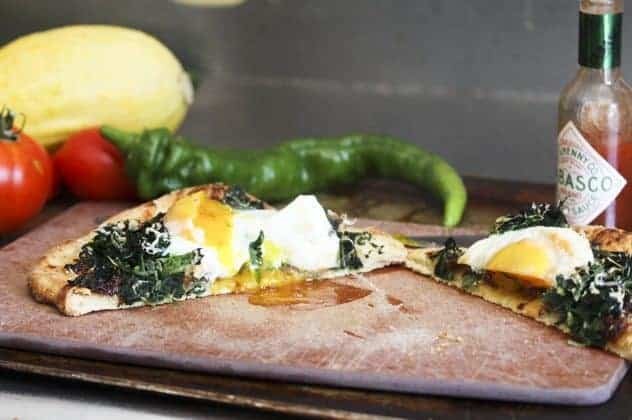 Oh, I love breakfast pizza with gouda, bacon, fresh basil on naan flatbread and a fried egg on top! Well here in Oklahoma I love me a Strawberry milkshake with crinkle cut fries from Braum’s Ice Cream. And as far as cooking gift card I would get the ice cream maker I’ve been wanting (cuz I don’t have one) and use it with all that spiffy Smucker’s ice cream toppings and bowls… yeah! Can you overnight me some of that pizza because it looks delicious, and the egg on top genius! I can’t wait to make this bacon jam, then surprise my hubby with this breakfast! (he does all of the actual cooking- I just preserve – so it really will be a shock). With the gift card? I would browse & drool for hours, then use it towards great knives for said husband. Fresh hot French fries are the best accompaniment to vanilla milkshakes ever. Just dip the golden, salty goodness into the creamy coolness of the vanilla shake for a quick trip to heaven! I like a coffee Oreo milkshake all by itself. My brother & my kids like to dip fries in their milkshake (yuck)! OH I love to eat any kind of add in to make the milkshake more delicious!!! Mostly anything with chocolate! A milkshake is a beautiful thing, all alone. I might put some roasted marshmallows on top, though. I love a chocolate milkshake with a hamburger and fries 🙂 I would probably buy a new pan since my favorite one just got ruined. The best things to eat with a milkshake are crispy, salty fries that you can occasionally dip into the shake. Yum. mmm… milkshakes…chocolate malt is my favorite! and $75 gift certificate would allow me to get some super cool gadgets for the kitchen! I love malted milkshakes with coney dogs and onion rings, or chili cheese fries, mmm heart attack. With a $75 gift cert. I’d like a food processor, pizza stone, or towards new pots and pans or knives. On my ice cream I like either chocolate syrup, caramel sauce, or blueberry orange sauce. Oh my! I can’t believe I won! I’ve never won anything in my whole life, never been the lucky type. You have made my day. I found foodiewithfamily via TK and PW, I’m so glad I did too becuase I love Rebecca’s recipes and photos. I can’t wait to try your no-knead dough recipe! Mmm. And this pizza is awesome. Just dip the golden, salty goodness into the creamy coolness of the vanilla shake for a quick trip to heaven! I’d spend the $75 gift certificate at cooking.com on an ice cream maker that I’ve been lusting over. A milkshake is a beautiful thing, all alone. I love a strawberry milkshake with a good juicy cheeseburger. Oh my! The best things to eat with a milkshake are crispy, salty fries that you can occasionally dip into the shake.